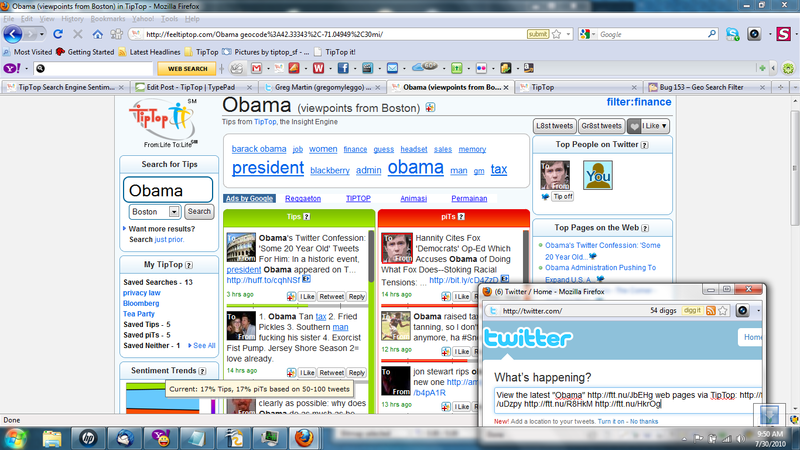 semantic search | TipTop Technologies, Inc. This week onwards you can use TipTop, the Insight Engine, to get the best tips, perspectives and personal connections from specific locations all around the world. The ability to get the best tips about local activities, haunts, businesses & news is as easy as entering a query in the search box on FeelTipTop.com & selecting a specific location from the adjacent “Any place” drop-down menu. There are many ways to make use of TipTop’s local social search such as geo-location marketing, asking local experts, discovering new restaurants, or learning how people feel about any local or global issue. 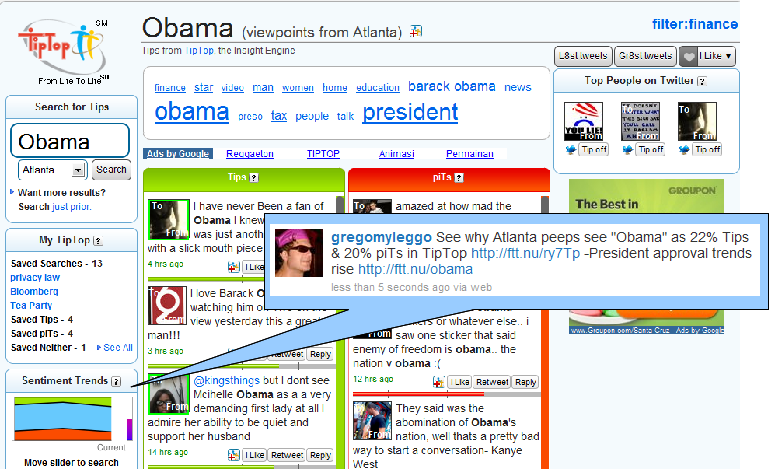 TipTop’s Atlanta “Obama” sentiment trends at the time of this search were 22% positive & 20% negative and the concept cloud topics included ‘news, gm, man, home, star, people, & speech’. Gregomyleggo shared these results on Twitter by selecting “Sentiment Trends” from the top right “I Like” button. 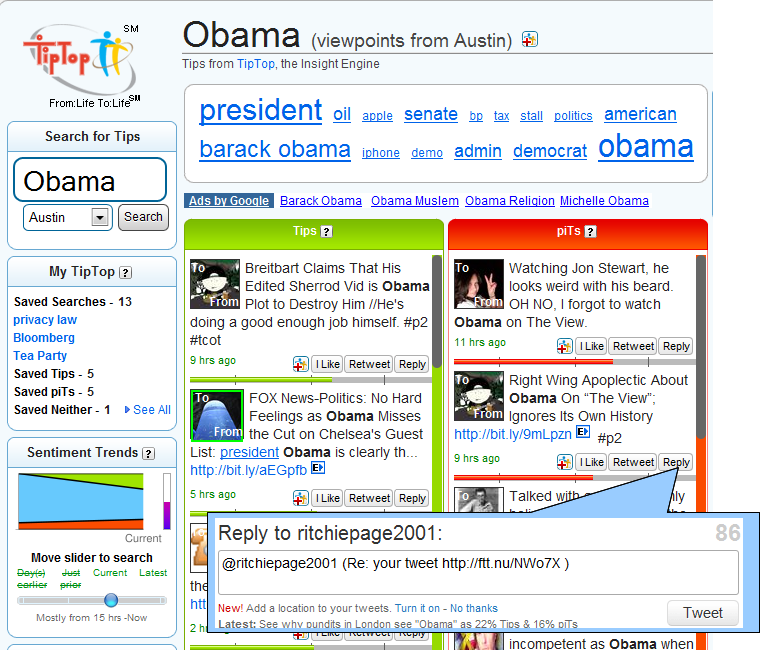 TipTop’s Austin “Obama” results had similar sentiment ratings to those for Atlanta. Of course, the topics were different, focusing on concepts like ‘oil, admin, american, senate & snooty’. Gregomyleggo saw a provoking snippet, so he clicked “Reply” to send a tweet to the poster. TipTop’s Boston “Obama” results showed people not thinking too highly of the President, tweeting negatively 17% of the time about topics corresponding to “Obama” & ‘people, admin, gm, blackberry, tv & headset’. Gregomyleggo thought a couple of the “Top Pages on the Web” TipTop extracted from these Bostonians were interesting enough to share on Twitter (by selecting the option from the “I Like” button). 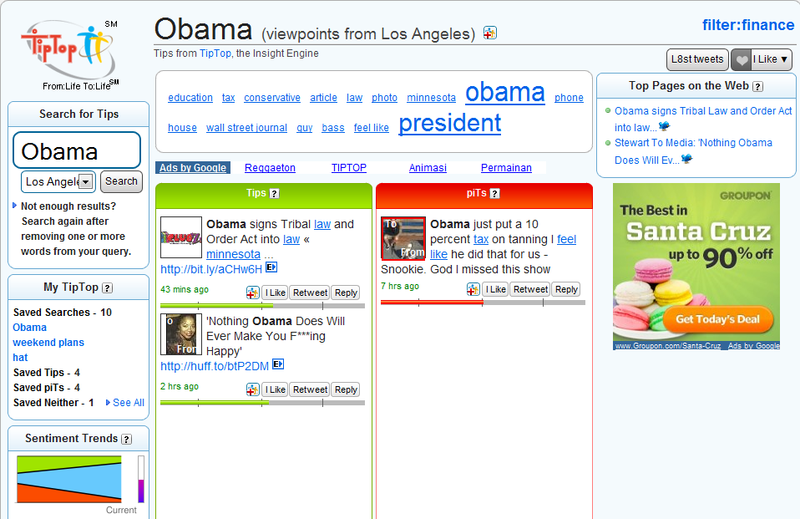 Chicago & Los Angeles pundits shared few opinions let alone similar sentiment toward the President. We should look more into how these folks thought about his appearance on “The View“! For a somewhat more international perspective, I took a look at TipTop results for Toronto & London. 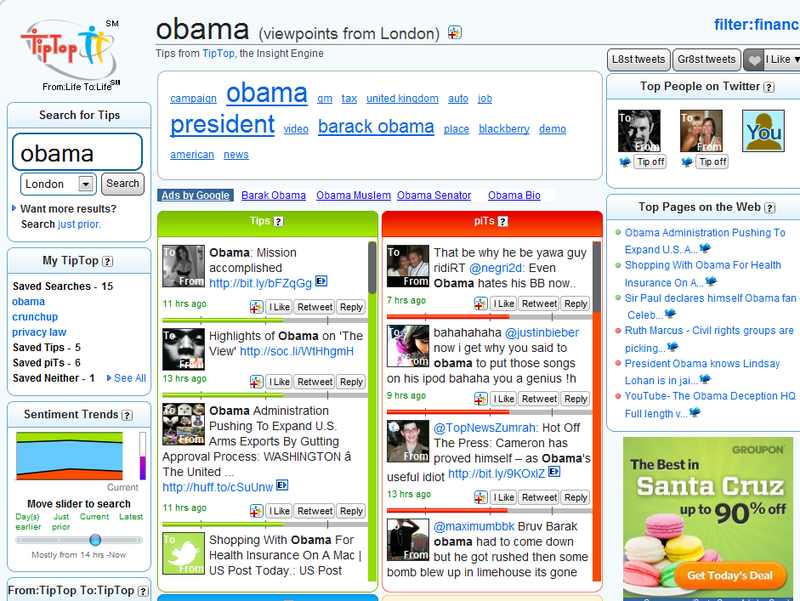 Tiptop found they are also tweeting about “The View” but their take on President Obama is quite different. 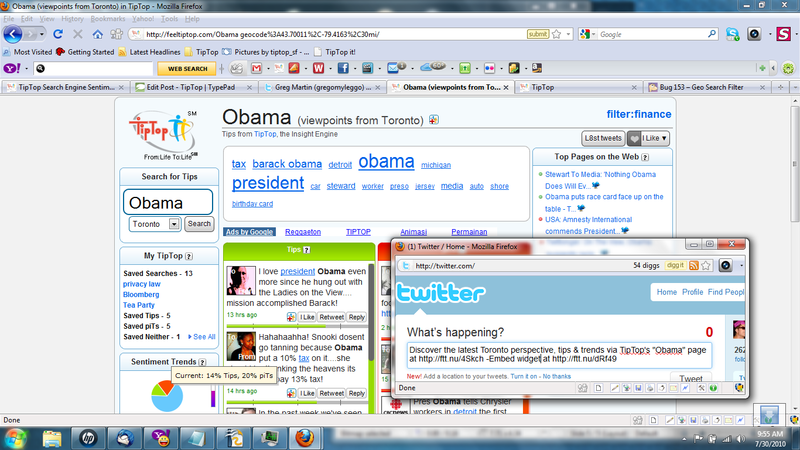 Toronto tweets are 27% positive, focusing on topics such as auto, detroit, worker, michigan & car. London tweets are slightly more negative, trash talking the President 18% of the time … mostly about “The View“, healthcare & his blackberry. Generally, TipTop’s social media polling trends spike before the “Gallup Daily: Obama Job Approval Poll” so keep an eye there and compare it to TipTop’s “President Obama Approval Ratings”! & others’ life experiences more & more TipTop. people to engage and share experiences with. 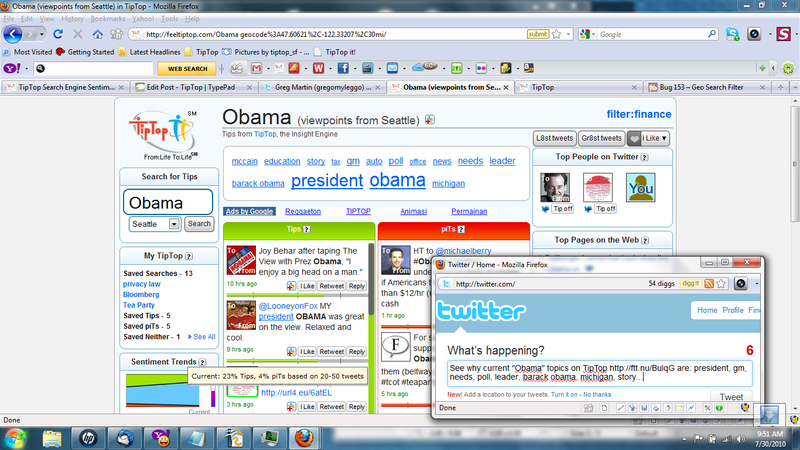 With TipTop Search you get easy access to relevant people, timely tips, and useful tools to communicate information. 1. Random Search "I feel lucky! 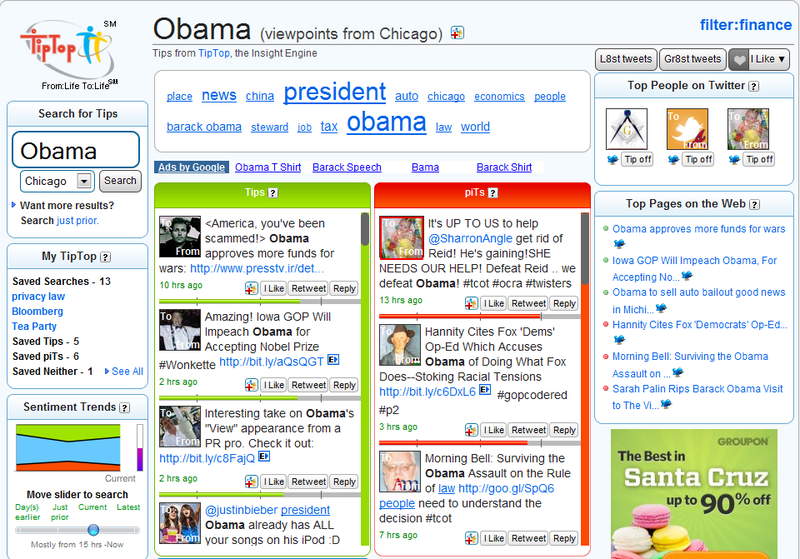 ": Click for an example of Sample Searches entered on TipTop. For more information, read our FAQs. 2. People Search: Enter "to:" or "from:" followed by a person's twitter ID or celebrity name to get messages to:Alyssa_Milano, from:Alyssa_Milano or about Alyssa Milano. 3. Advanced Filtering Techniques: Using proprietary techniques to remove duplicate tweet content & marketing spam postings. For more information, read our FAQs. separates them from the less useful ones. Tweet or message sentiment analysis is displayed as Tips & piTs results and concepts and topics are extracted from tweets and displayed to "Filter by" in the search results sets. 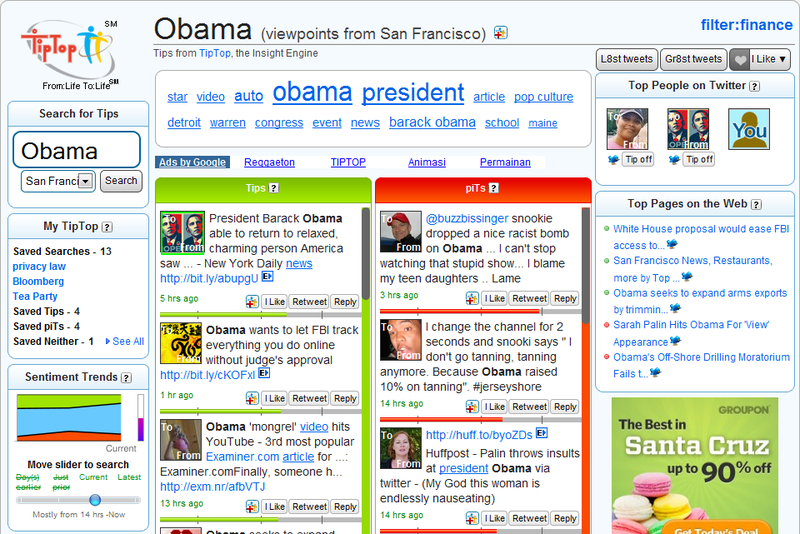 Displaying the best tweets from relevant people to enable information gathering, content sharing and topical conversations. Click the image for examples. Enjoy and have a TipTop week!